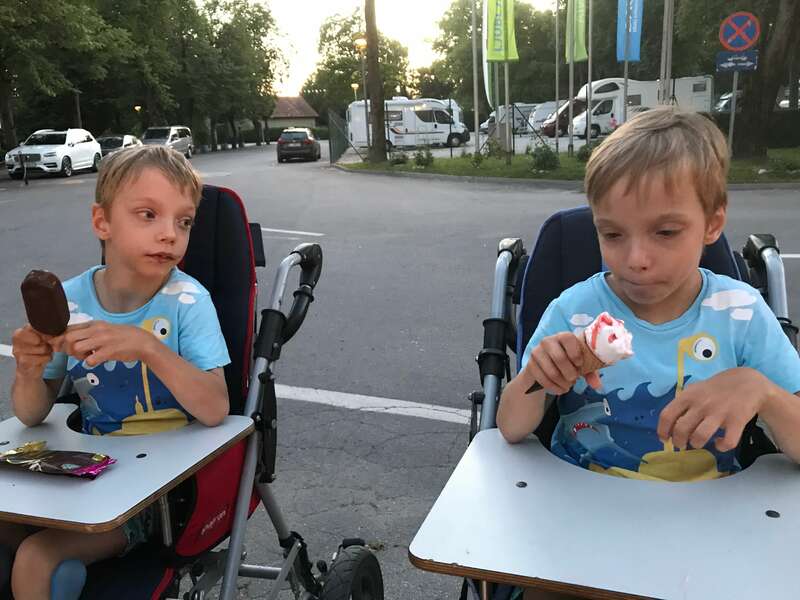 We are raising money for 9-year-old twins Anže and Enej. They were born three months too early and because of that they are still unable to walk. Their dream to is to stand alone on their feet and doing sports like other children. For this to come true, they need additional physiotherapies to gain the strength for walking. Unfortunately, the costs for the therapies are too high for their family, in which only father goes to work. Sodeluj v Proof Of Charity z deljenjem te kampanje. Prijavi se. We are two twins named Anže and Enej. We will turn 9 in August 2018. We were born three months too early, weighing less than a kilogram, and still can’t walk. We both suffered from brain damage due to a lack of oxygen. Because of this misfortunate event our physical development wasn't spontaneous, we had to learn everything with the help of physiotherapy. The first four years of our lives we visited our physiotherapist in a health facility once a week, which was much too little to catch up to the physical development of our peers. Since physiotherapy sessions are expensive (one hour costs 40 to 60 euros), our parents weren't able to pay them to such a big extent. All this led to receiving a bad news - our physiotherapist told our parents that we will never get the chance to walk. Although they had received this terrible news, they did not give up on us. They still encourage us every single day with a strong belief that we will walk one day. And we are sure of that too. That’s why we love them the most in the world and we also know how much they love us. Our mother left her job to stay at home and take care of us, so only our father works. 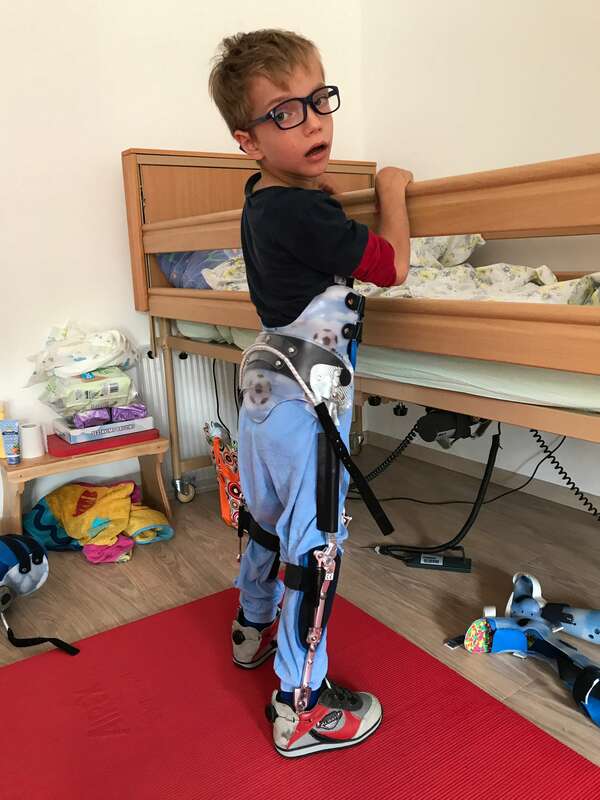 Because they didn't see any other way, they turned to the good people in 2013, who gathered enough funds for us so that we could visit physical therapy sessions of dr. Maja Roje Novak in Zagreb, Croatia. She gave us hope to not give up and let us know that we both have the potential for walking. In that time, we both advanced so much that we became prime candidates for a very difficult and risky spine operation named selective dorsal rhytomy (SDR). On the 28th of October of 2015, Dr. Park of the Pediatric hospital of Saint Louis in the US, who has helped more than 3000 children from around the world, operated us. Dr. Park ensured that our legs weren't so spastic anymore. On the 22nd of November of 2015, we both underwent another surgery. Dr. Dobbs lengthened our shortened knee tendons and did another procedure so that we don't cross our legs anymore. Dr. Park predicted, that we will be able to walk only if we receive a lot of physiotherapy after the surgeries. And walking is the thing that we most want in the entire world. For this to come true, we need additional physiotherapies to gain more strength and courage. In primary school that we are going to we are entitled to a maximum of two hours of physiotherapy, as is prescribed by the school system. Unfortunately, this is far too little. We also have to overcome our fear of falling, as we have become too weak to achieve the advancement needed for walking due to a lack of physiotherapy. Our parents are also doing different exercises with us as much their time and health allow them. We truly appreciate their effort, but the positive effects would be even more stronger, if the therapy was executed by a professionally trained physiotherapist. We would need their help every single day for at least one hour after school, but the costs for that are too high for our family. That is why we turn to you for help. An improvement we could also reach, if we went to the Neuron rehabilitation center in Bidgošče in Poland for six weeks (http://osrodekneuron.pl/en/home/). 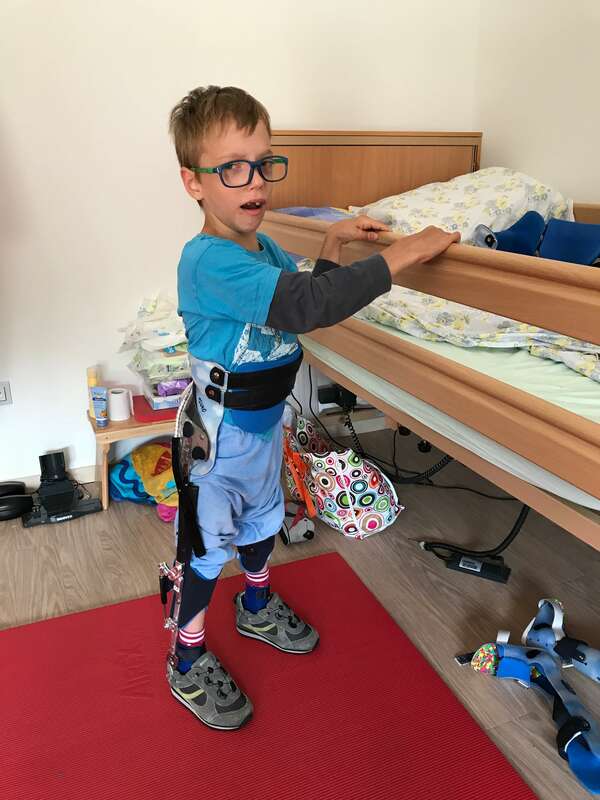 There we could have physiotherapies for five hours a day, every day excluding Sundays, while also walking with a robot for at least an hour a day (the cost for one child is 100 euros per day). The path to there is long, as it is a 15-hour drive away, however, our parents say that the therapies are at least 50 percent cheaper there, so the long journey is worth it. Since we are twins, all the costs of therapies are doubled, which presents another obstacle for our family. Because of this we are getting further from realizing our dreams to one day walk as our classmates. For now, we can only watch them doing sports after class, playing in the field and walking alone to school from our wheelchairs with sadness in our eyes. In spite of this, we have not lost our hope. And our parents did not as well. We are often spending time alone with our mother, since dad is absent a lot, as he works in three shifts so that our family can survive. Our grandmother is also very ill and he takes care of her also. However, this often means that he doesn't come home for three or four days. It's not easy for us, but we love each other's company and the moments that we share are always special. We will be extremely grateful, if you can help us reach our dreams and make our parents the proudest parents in the world. Please, receive our sincere gratitude in advance. Yours truly, Anže and Enej.